After trading away their first round pick in the 2015 NHL Entry Draft (along with Rob Klinkhammer in exchange for David Perron), the Pittsburgh Penguins' first pick of that draft would then be their second rounder, or the 46th overall pick. Rutherford ended up using this pick to draft (and pretty much steal) the Dutch-born right winger Charlottetown Islander, Daniel Sprong. After having a very impressive pre-season, Sprong made it past cuts and was kept on the team for a nine game tryout period. The rule regarding junior players is that if they are signed to an NHL contract (which Daniel Sprong is), they may play 9 NHL games. Once they are suited up and in the lineup for a 10th game, the entry level contract kicks in. Whether he stays with Pittsburgh the entire year or is at some point returned to the QMJHL, the first of three years on his contract will expire. Daniel Sprong, given his promising play, has played more than the 9 allowed games before the contract burns the first year. Some people see this as a problem, given recent coaching decisions. Out of the 24 games played by the Penguins, Sprong has only been suited up for 14 of them. The last game he played was on November 17th against Montreal. Sprong has been a healthy scratch since that date. So, why was he kept up past the 9 game limit if he was going to be sitting? Why did Jim Rutherford decide to do this, knowing the consequence of burning the first year off of Daniel Sprong's entry level contract? Does this make sense? The simple answer: Yes. Yes it does. First off, Daniel Sprong has nothing left to learn in the QMJHL. As his 69 goals and 156 points through 135 QMJHL games (in addition to 11 goals and 16 points through 14 playoff games) show, Sprong had little to no problems dominating the league as soon as he started playing in it. He could do things to QMJHL regulars and/or scrubs that you'd see Sidney Crosby do to players of the same relative skill level in the NHL. Dangle around them, embarrass them, et cetera. Many have noted that Sprong is great with the puck on his stick, but his play away from the puck can use improvement. You know where he can learn that? At the NHL level. Even if he isn't playing games, he's consistently practicing with NHL caliber coaching (I know, I know) and NHL caliber players. One of which is the best player in the world in Sidney Crosby, and another who is one of the most talented right wingers in the world in Phil Kessel. These are better teachers for him than Charlottetown teammates Kameron Kielly or Quinn O'Brien. Both of these support the fact that the QMJHL is one of the easiest leagues in all of recorded hockey. The fact that Daniel Sprong is playing so well against competition after playing junior in the QMJHL is very rare, however it's obviously welcome to the Penguins organization. Sprong has a lot more to gain by sticking with the big club, in terms of both development and hockey knowledge. Now, onto the contract issue. A lot of people are less than happy with Jim Rutherford due to his decision to keep Sprong up, as this burns a year off of his entry level contract...well, so what? As Ryan Wilson (@GunnerStaal) said in one of his hockeyhurts.com podcasts with Cameron Walsh (@walshy66), "What, you gotta pay him?" (paraphrased). Good players earn the money they get, and usually get paid that money. By the time Sprong's entry level contract expires, all three of Rob Scuderi, Chris Kunitz and Pascal Dupuis will be off the books. That's a combined $10.975M of cap that will presumably be cleared when Daniel Sprong is an RFA (considering other assets that may be dealt away or assigned cap, you can give or take some of this number). The Penguins will most likely be able to afford him, and will be able to pay him the money he will most likely deserve at that point. So people who are terrified of the entry level contract kicking in: don't be. There isn't much of a reason to be. 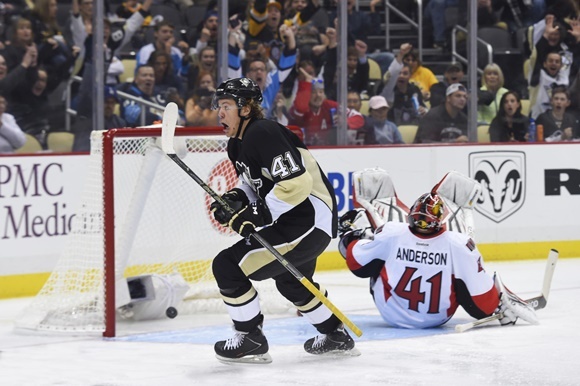 Does Daniel Sprong deserve more playing time than head coach Mike Johnston is giving him? Perhaps he does. However that ice time should be at the NHL level, because his practices will help him become a better player more than more ice time in the QMJHL will.